Your Task: Create a label for your own brand of beverage. Can be alcoholic, soda, or something strange and exotic! . 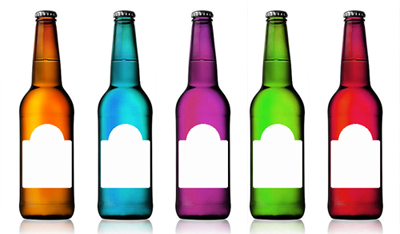 All entries will be put onto a picture of a beer bottle and depending the colors in your design you can pick from one of five colors (see image under the color ball image). The color ball is a little bit bigger then previous ones this is to help people fit more legible text onto their label designs. Yes! amazing theme! I´m totally in! Did you mean Saturday 19th August? Yeah, we all have our brain farts at times. yea Saturday, 19 June 2021, problem? Well, anyway, I quickly made a cool label. Remember the Dragon's Breath from Quest for Glory 1? Well, let's just say it now has some competition for "deadliest drink". The label reads "Sasori Doku" (literally "scorpion venom"). Just as with Dragon's Breath, before you consume a bottle, SAVE YOUR GAME FIRST!!!!! [Add on] Might be good to put on a purple bottle. Alcohol Volume 65% SOOO MANLYYY! Coding Fuel is an energy lifestyle drink for the young software development go-getter. Starting with a base of caffeine, we add only the finest grade codeine, taurine, guarana, B-vitamins, E102, pharmaceutical run-off and cocaine. The result is the perfect formula for late night programming and stubborn mildew. I think this might work best on a red bottle because red means danger. Well done guys. Great start to the contest so far! An ancient drink comes from the Ages of Cat Gods! Made from Horus's R and waited for 10.000 years to be ready. $100.000 for 5 cc and doesnt comes with blue bottle. From the bravest hunters of the universe, we bring you the most desired beer in the galaxy! Forget dehydrated water! Caution: several customers complain about burps causing mild quakes. Remember! Never drink while riding your Falton Sand Skimmer! But yeah, don't drink and drive--not even in outer space! So far so good, guys! I love these labels!